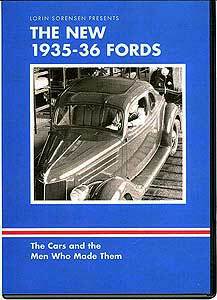 The New 1935-36 Fords DVD by Lorin Sorensen. This film is a first hand look at making the 1935 and 1936 Fords. Henry Ford discusses prospects for 1935 V-8 sales while top men Charles Sorensen and Peter Martin discuss production, and Chief Engineer Lawrence Sheldrick explains new chassis improvements. Ride along as Ford engineers road test cars on the back lots of the Rouge plant. Be there with Henry and Edsel Ford as they watch their 2-millionth V-8 come off the line. Then Henry and Edsel drive the first '36 Ford off the line, and stroll through the engineering lab. A couple looks over a new 3-Window Coupe at the local Ford dealer. Typical buyers take delivery of new Fords. The fascinating footage shows manufacturing & assembly including glass-making, a description of the new one-piece steel wheel, and Edsel Ford speaking about the newly styled '36 Fords. Different body styles, interiors and features of models such as the Tudor, Fordor, Coupe, Roadster, Phaeton, Cabriolet and Convertible Sedan are explained. Running time: 54 minutes, black & white, sound. © 1990, 05 Lorin Sorensen. All rights reserved.